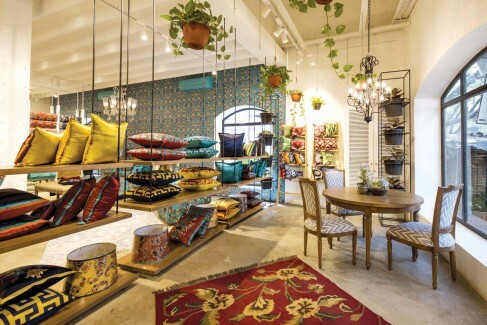 Cottons & Satins by Mala, well known for its bold aesthetic sense, begins it journey in Mumbai with its first home textile store proudly showcasing the brand’s USP of bespoke furnishings. There is a dedicated kids’ area with wooden steps beautifully lined with small cushions and accessories, and a tepee. A conspicuous stand alone building with a red-brick façade stands elegantly in the dynamic Lower Parel-Worli area in Mumbai. It warmly welcomes the visitor into a colourful world where fabrics play a very important role. Of course, the name alludes to the fact that upholstery occupies centre-stage in the store. “Cotton and Satin are the first two fabrics I sold, hence the name”, explains Mala Sapra, Owner and Founder, Cottons & Satins by Mala. The 6000 sq ft space was conceived by Delhi-based interior designer Amith Chhabra. The interiors can be best described as an industrial barn with a modern and intimate feel. The large universe of home textiles and accessories is sub-divided into harmonious areas. There is abundant natural light thanks to the large glass greenhouse entrance and huge windows. As one enters, one can see rolls of indigo and khaki printed fabrics around a raised platform, where on display are various seating arrangements made up of cosy sofas and contemporary rocking chairs. Considering the product offering, this is quite an apt feature. The store features a unique blend of upholstery, textiles, cushions, duvets, furniture, lamp shades, carpets, wallpapers and home accessories. The meeting area has a display wall. This is a canvas for displaying the small furniture pieces and accessories. Here, one finds large wooden tables with benches and chairs. 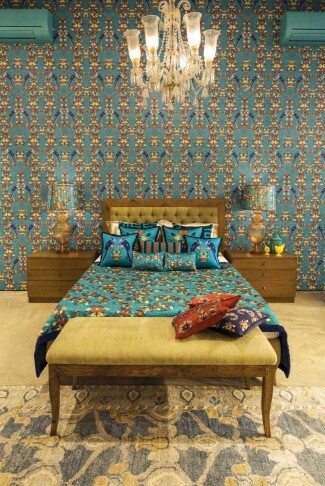 There is a dedicated area for wallpaper and the silk collections where the latest collections are housed. The final finishing touch is provided by a large cut-glass chandelier above an opulently furnished bed. All these elements are eye-catching and elegant, just as expected in a store that specialises in home textiles. However, this store has two additional unique features. Firstly, there is a dedicated kids’ area with wooden steps beautifully lined with small cushions and accessories that eventually lead up to a hammock at the far corner. A tepee filled with cushions and story books keep the client’s kids well entertained. The interiors can be best described as an industrial barn with a modern and intimate feel. The other feature is the loft built over the far left end of the stairs. A delicate wooden staircase spirals up to the glass structure which provides expansive views of the entire store below. This area mimics an actual apartment complete with bed, living and dining areas on display. 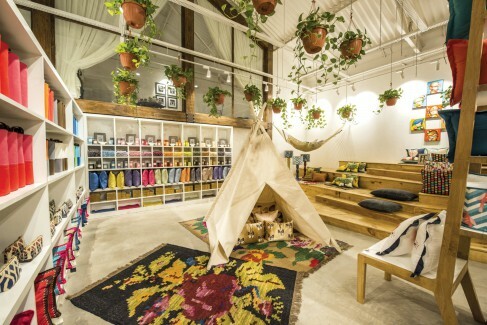 The store has used plants and terrariums extensively to imbue an organic vibe. When Sapra started Cottons and Satins back in 2011, in Delhi, there was a gap in the market for Indian fabrics and prints done with traditional techniques. “I tried to fill that gap and fortunately for us we succeeded. Screen printing is our USP and we particularly specialise in bespoke furnishings. 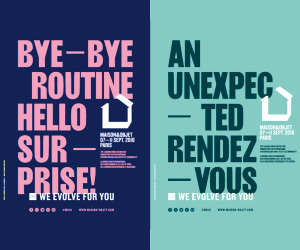 We customise to the choice of client colours for a quantity as low as 10 metres,” she says. The loft mimics an actual apartment complete with bed, living and dining areas on display. 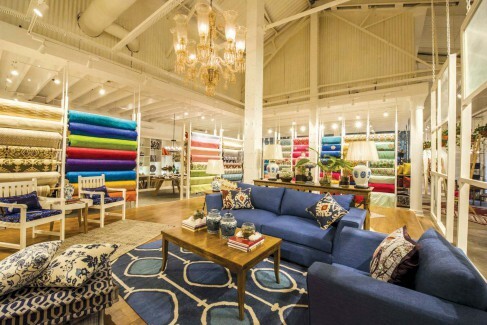 The store features a unique blend of upholstery, textiles, cushions, duvets, furniture, lamp shades, carpets, wallpapers and home accessories. Of course, the signature screen printed handloom cotton fabrics are specifically conspicuous. 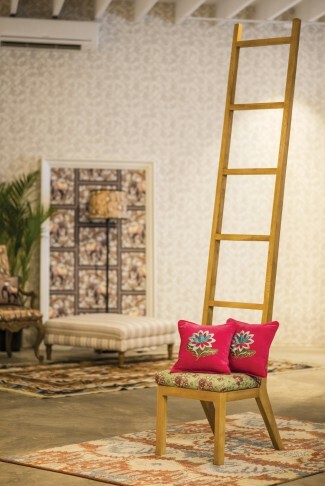 The brands first furniture line, exclusively to Mumbai has been launched recently. “The new furniture line is a reflection of our aesthetic – a marriage of modern and classic. A lot of clean lines and beautifully upholstered sofas and arm chairs,” she explains. Sabra recognises the importance of store décor. “Interior and textile design is visual, and therefore decor and displays can have the maximum impact on the buying decision. A beautiful product kept in a cluttered shelf will lose it visual appeal whereas the same product kept in the right space, under correct lighting and amongst complementary colours will be twice as eye-catching,” she concludes.